When it comes to technology the Philippines have been always dependent to foreign country, however starting March 1 the first-ever made Philippine train will start its service to the Filipino people. 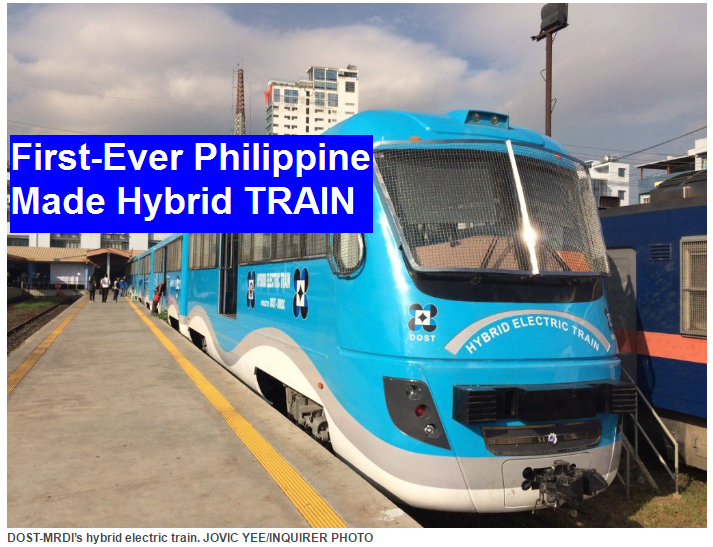 The hybrid train was developed by DOST's Metal Industry Research and Development Center (MIRDC) in 2013. the P120-million project was launched to the media as proof that Filipino scientists and engineers have developed a solution for the country's perennial transportation problems. "It's high time that we give recognition to the fact that we are fortunate to have the best engineering and technical minds in the country... We have the solutions to our own problems. We can make local technologies work," Science Secretary Mario Montejo said during the launch at PNR's Tutuban station in Manila. The train can accommodate 220 passengers and run at a speed of 50 kms/hr in route from Alabang to Tutuban and vice versa. The hybrid electric train will drives both diesel and lithium batteries which emits less carbon and energy-efficient transport system.